Loafing Odysseys: Hanging on the Wall. 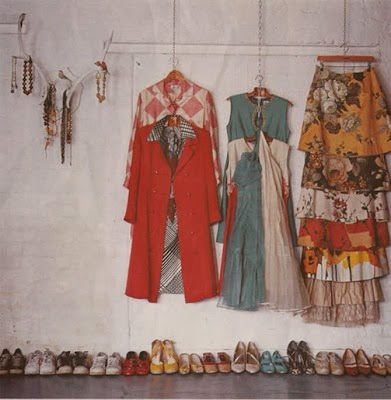 I love the way these clothes are arranged. 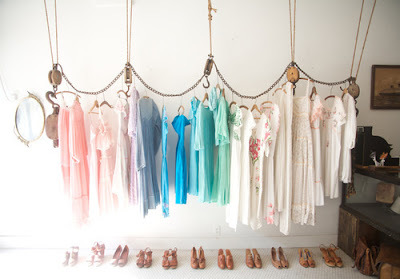 It would probably be difficult for me to keep my closet space this clean, but it makes for such a unique way to display one's wardrobe! yeah it's great to be able to see everything out in the open as opposed to hidden in a closet. i would never be this neat and minimalistic (i'm just way too much of a pack rat), but these are beautiful and the first photo is amazing! maybe if i owned a clothing store...?